I made these fabric postcards a few weeks ago. 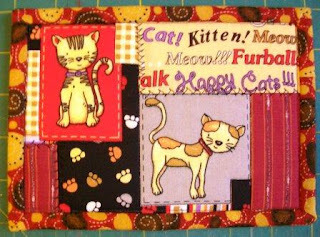 They were made specifically to be donated to the Pet Postcard Project. Each postcard is 5 in X 7 in. 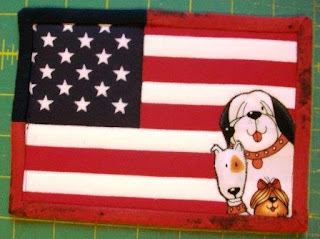 For this first one, I fussy cut the dogs which were then machine appliqued onto the flag. 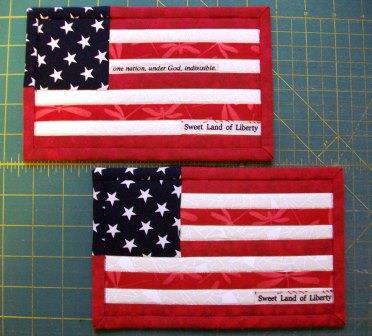 I then machine quilted the flag before assembling the postcard and binding. This one features a fussy cut cow wearing a Christmas wreath which is machine appliqued onto the background fabric. As with the first, it was machine quilted before assembling and binding. This one is pieced, then machine quilted before assembling and binding. 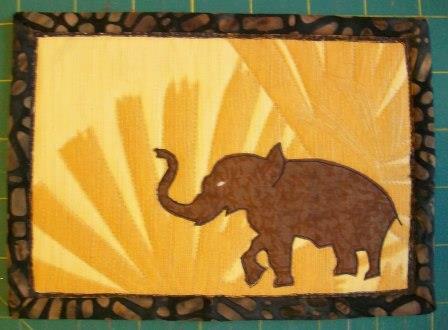 For this one I machine appliqued a fussy cut elephant, then machine quilted before assembling and binding. This one and the flag with the dogs are my favorites. 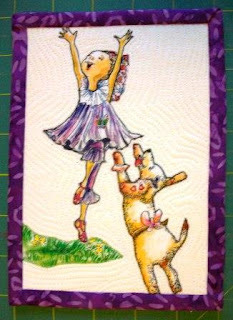 The fussy cut girl, dog, and grass are machine appliqued to the white background. 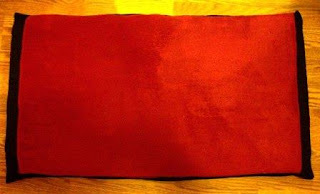 It was then machine quilted before assembling and binding. 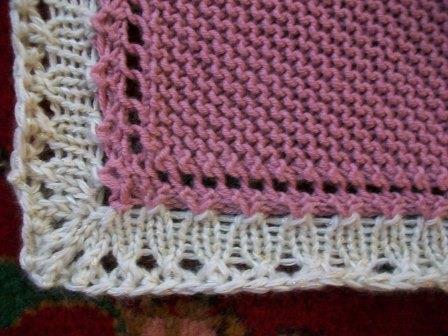 I knit this baby blanket, 25 in square, using a basic diagonal pattern increasing until I had used up 1 skein of the two skeins I had of Debbie Bliss Baby Cashmerino then began the decrease. 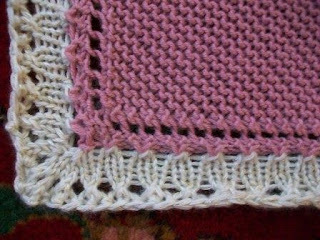 I then picked up stitches around each side and knit a simple border in the round to increase the total size of the blanket using two other yarns (leftovers in my stash from other projects-- Artyarns Ensemble Glitter Light and Filatura Di Crosa Zarina. 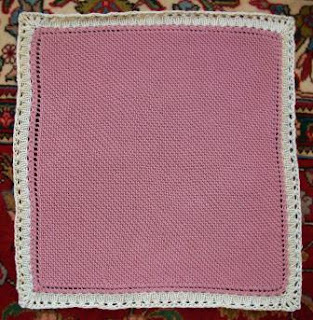 I gave the blanket to a little girl who is the granddaughter of a nurse anesthetist I used to work with at Little Rock Surgery Center. I made two dog beds, approx 20 in X 36 in (only one shown but both alike). 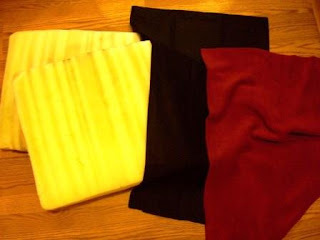 I made them using recycled cushions from outdoor furniture (the covers where in taters), pillowcases, and fleece fabric. I gave the beds to my local humane society. Here are the materials used prior to be put together. Each dog bed contains two of the recycled cushions. 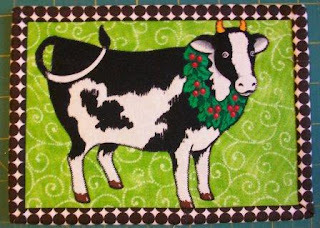 I recently completed these two fabric postcards. 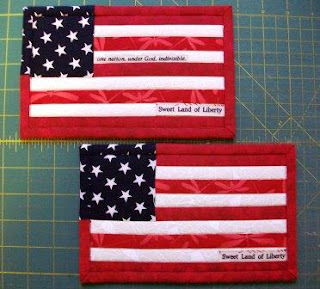 Both are machine pieced and quilted. Both measure 5 in X 8 in. I plan to send the top one to a friend for his birthday. 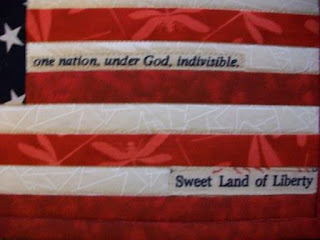 Here is close photo to show the words.